Love Bug Living: Organize those Jeans (and maybe those purses too)! Organize those Jeans (and maybe those purses too)! I'm thinking I might have too many jeans. That doesn't mean I'm getting rid of any though! I really haven't been shopping at all. I've just accumulated them over the years. I've gotten rid of those out of date styles and the ones that just aren't comfortable. So the rest of them are all different styles and lengths for different occasions. Some are longer to wear with heels and others are more casual to wear with flats or sneakers. The problem is when I'm in a hurry to get ready, which is always, I can never find the right jeans and end up wearing the same pairs. I've come up with a solution though! All you need are some index cards and some rubber bands. Simply write the jeans style and what type of shoes go best with them. Punch a hole in the card and attach it to a hanger with a rubber band. Also be sure to write the brand of jeans, or name, and size on the back of your cards so that it is easy to hang the jeans on the right hanger after washing them. Don't have time to try on all your jeans at one time? Just keep the supplies in your closet and try on one or two pairs each time you are looking for some to wear. Label them as you go and they will all be done in no time. Too many purses to keep organized? To make better use of storage in my closet, I have a clear platic bin on a shelf in the top of my closet that I keep my purses in. This makes it hard to see what purses I have without getting the bin down and going through it every time I want to change purses. What I did was take a picture of each of the purses and put it in an inexpensive photo album. I grouped them by style and color. 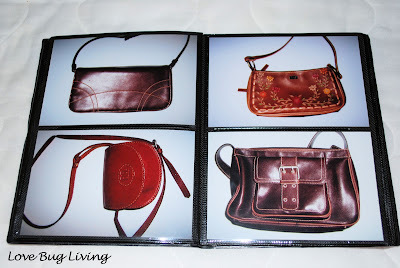 That way, whenever I was looking for a certain style or color of purse, it was easy to find in my book. That made it much easier to pick out a purse and then simply take it from the bin. 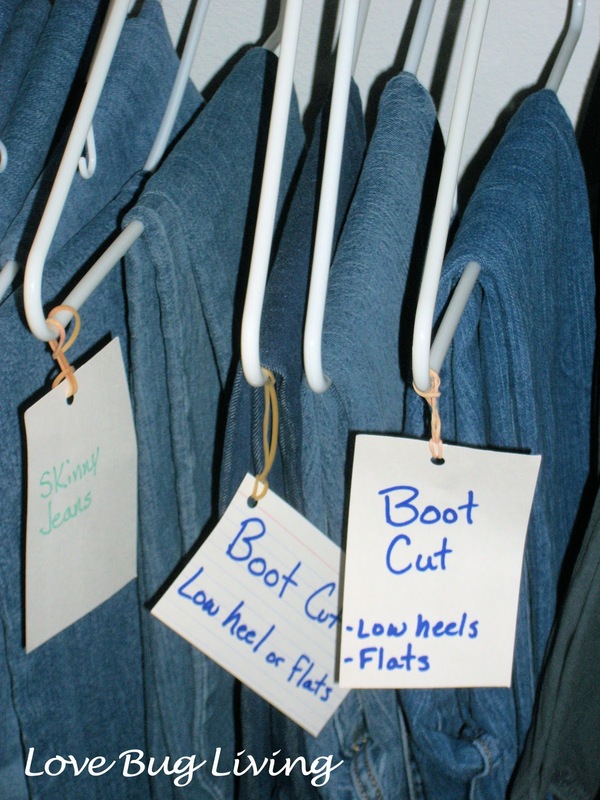 Hope these ideas help you to organize your closet! 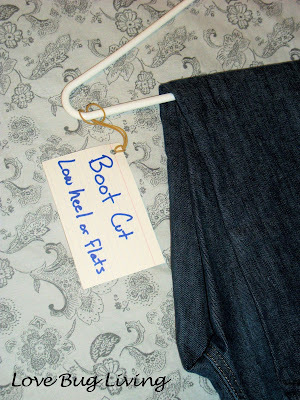 I don't hang my jeans, but this little trick might be a life-saver when it comes to organizing the multitude of dress pants I've accumulated over the years.